what happened to wednesday’s gallery? well, i lay in bed all day cultivating a cold. no gallery. oh well. After last week’s awesome experience of Idea and Object, I was looking forward to this section. I thought it would have been a great investigation of the art up until the 60s, incorporating the conceptual art movement: Fluxus (of which i’m quite a fan). I was sadly mistaken. Overall, i felt like it was called States of Flux because they couldn’t find a way to tie these pieces together coherently, so it was easy to label them as flux, which is kind of way off the mark. Anyway, despite that feeling about the overall flow of the section, it was also a section full of excellent artworks. Seriously fantastic ones, like a couple of important Picasso cubist works with his partner in crime, Braques, The Kiss by Auguste Rodin (swoon!) and a couple of excellent Claes Oldenbergs. 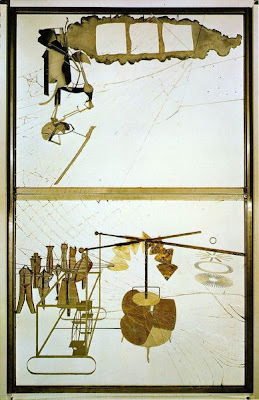 The main image i went ga-ga over was Marcel Duchamp‘s The Bride Stripped Bare by her Bachelors, Even (which would have been perfectly complemented by Bride Falling Down the Stairs – his awesome cubist work). The Bride Stripped Bare, a glass drawing of the mechanics of human relationships and male/female desire is an important conceptual work – more a diagramatic blueprint and narrative than a visually cohesive piece, but it paved the way for all kinds of amazing works based on idea. The work in the Tate is a sanctioned replica by none other than UK pop art king Richard Hamilton and very well done, although i do like the glass cracks and dust in the original. I drew a horrendous drawing of it, all outta whack, so today, it’s a picture nicked from Wikipedia instead. And just as a little tidbit, while I didn’t quite go as loopy about it as I did the Marcel Duchamp, checking out Roy Lichtenstein‘s Whaam! pick, I suddenly got what i had read and heard in art history and theory about his work. He introduced the idea of craft into that which is normally taken for granted as mass-produced. He painted dot screen! I know, duh. Anyway, the penny dropped and I finally understood the flow on of success and understanding to Andy Warhol (who, by the way, doesn’t make me weak at the knees, like he should).